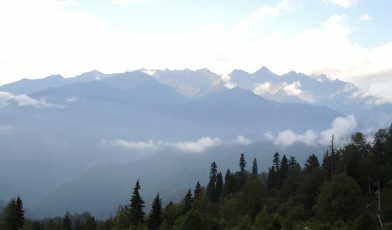 The flora of Georgia is extremely rich, diverse and unique. Over 380 endemic vascular plant species have been recorded with most being well known for their medicinal properties. With many species close to extinction due to major threats of habitat degradation, illegal harvesting and soil pollution, the race is on to catalogue and conserve the country’s incredible flora. The Global Trees Campaign is working with botanic gardens in Georgia to electronically record their native plants collections, particularly threatened tree species. BGCI has been supporting botanic gardens in Georgia since 2009. A priority has been to record the native plant collections and gather information on work programmes and facilities at the botanic gardens, as well as making this data available in BGCI’s PlantSearch and GardenSearch databases. By 2011 survey work and digitisation of the collection of rare and native plants of the Caucasus was completed for collections at the botanic gardens of Tbilisi and Kutaisi. The information was also uploaded to BGCI’s PlantSearch database, with the Tbilisi Botanical Garden collection including a total of 350 species. In 2012 work to digitise the collections of Bakuriani Alpine Botanical Garden (BABG) was completed. In total, some 469 species, belonging to 200 genera and 70 families, have been recorded and uploaded to BGCI’s PlantSearch database. These include some 200 species native to the Caucasus. In parallel, information on facilities and work undertaken at BABG has been updated in BGCI’s GardenSearch database. Since 2013, BGCI, in collaboration with the Institute of Botany, Ilia State University, Tbilisi has been developing an integrated ex and in situ conservation programme for the rare Nitraria schoberi. Identified as a very rare and threatened plant in the Red List of Georgia (2006), Nitraria schoberi is a remnant woody species forming small populations currently known from only a few localities, predominantly xeric habitats, in southern and eastern Georgia. According to the Red List of Georgia, this species is threatened due to cutting and grazing. In the same way, in partnership with the National Botanic Garden of Georgia, Tbilisi, a new conservation project for the endemic Georgian almond, Amygdalus georgica was initiated in 2014. Both projects include the survey of wild populations, collection of propagation material and ex situ cultivation. Outreach materials have been developed to raise awareness of the wider public of diversity of the Georgian flora. In 2015, GTC would like to continue with these activities and strengthen the development of a stock of plants of the target species for in situ population reinforcement programmes. In parallel, meetings with relevant government agencies will be held to define in situ protection measures of priority wild populations. In addition to this, in collaboration with the National Botanic Garden and the Institute of Botany and Stone Lane Gardens, GTC are aiming to develop an integrated ex and in situ conservation programme for Betula megrelica. B. megrelica is a Georgian endemic, assessed as Endangered by IUCN and is threatened by overgrazing and harvesting for fuel. In 2015, field surveys will be undertaken, propagation material collected and discussions held to determine suitable practical measures for sustainable management of this species. The Global Trees Campaign has supported tree conservation in over 25 countries, implementing conservation projects for over 100 threatened tree species.